When Positive Half cycle Applied to the circuit Diodes(D1,D2,D3) are forward bias. Voltage Across Diode(D3) is 0V. But When Negative cycle applied to the circuit All diodes gonna reversed bias right? Diode D1 and Diode D2 Acts Like open circuit. So how voltage across Diode 3 Gonna low? 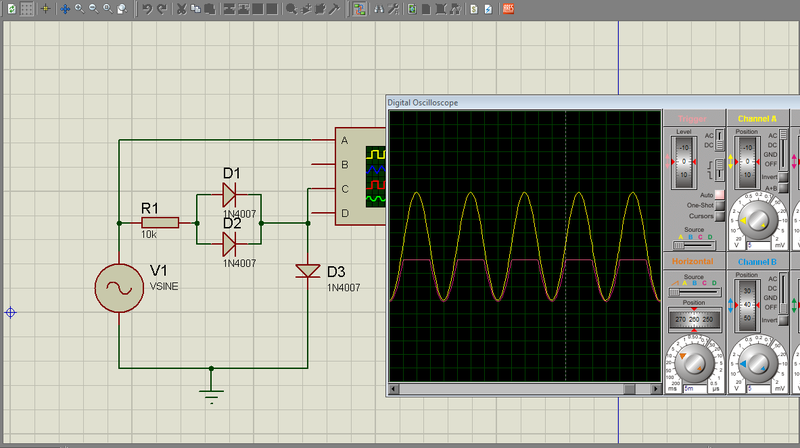 Yellow color is Input wave shape and Red color is output wave shape. "Diode D1 and Diode D2 Acts Like open circuit"
To DC, yes, but to AC more like a capacitor! Several incorrect "facts". (1) On a positive voltage from the signal source, the voltage across D3 is NOT 0V. It will be more like 0.7V. We cannot tell the time scale since those facts are hidden. But, for LOW frequencies (under a few KHz or so), that "oscilloscope" plot is patently wrong. Across D3 on negative voltages, the voltage will be zero because D1 and D2 will be back biased. the circuit is very misleading, in part, because of the choice of the 1N4007 diodes. These are low frequency power diodes. They have a lot of capacitance AND a fair amount of leakage. The consequences of this are made even worse by having D1 and D2 in parallel. That makes the leakage and capacitance even worse. The circuit is also misleading for not having any "load". I think that, in this case, its a matter of GIGO - Garbage In, Garbage Out. You will get misleading results from a misleading circuit. So if i consider an Ideal Diode then what happens? That won't improve a nonsense circuit. What are you trying to demonstrate with this circuit? Actually this a text book math problem in Clipping Circuit Chapter. Due to the leakage through the diodes, this waveform does make sense. D1||D2 and D3 form a voltage divider. The current will be near zero, but still present. Because it's so small, R1 has little to no influence. Once you connect a load from where you're measuring to GND you will get pretty much what you expect: zero voltage while the source is below ca 0.7 V.
Piece-wise linear analysis works very well, here. Assume low frequency (below a few KHz) signal from V1. V1 > 1.4V, the output will be approximately 0.7V due to forward "clipping" of D3 and the current limiting of R1. V1 < 0, everything is governed by leakage currents. Due to D1 & D2 in parallel, there are two units of (leakage) current in the branch through R1. But there is only 1 unit through D3. Leakage current is small, so the voltage drop across R1 will be small. So, the voltage across D3 will be approximately that of V1. In the range 0 < V1 < 1.4V, behavior is hard to describe. About the only thing that this circuit demonstrates is that leakage currents can give you strange behavior, often somewhat unpredictable, and often inaccurate to simulate. A much more useful and realistic circuit would have a load resistance (and maybe capacitance) across the output. With a load resistance of, say, 1K, you would have grossly different behavior. The voltage displays low on the oscilloscope because the ground (zero volts reference point) on the scope is the middle of the sine wave (the zero-cross point, where the derivative of the voltage over time is infinite). The triangle side of the diode symbol is the anode. The straight line side of the diode symbol is the cathode. Ground (zero volts) is the middle point of the sine wave. On the positive direction of the sine wave [ from the middle of the sine wave to the top], positive voltage will flow through R1, D1, D2, and D3. D1 and D2, being in parallel, show a single diode drop of 0.7V. Peak voltage at point A is VSINE/2. Voltage at point C is a sine wave that is clipped at +0.7V. Voltage at R1/D1D2 is a sine wave that is clipped at +1.4v (two diode voltage drops of 0.7v). On the negative cycle ([ from the middle of the sine wave to the bottom], voltage reverses direction and again flows through D3,D2-D1, and R1. Point C measures peak voltage at negative (VSINE/2 - 0.7) volts. Peak negative voltage across R1 is (VSINE/2) - 1.4v (two diode drops). No, the time derivative of a sine at the zero crossing is far from infinite. It is certainly its highest there, but not infinite. No derivate is infinite anywhere in a sine; in the derivative sense, sine is one of the best behaved functions we have. Perfect open circuits have infinite resistance, but that doesn't exist in reality. Reverse biased diodes have a saturation reverse current that is more or less independent of voltage drop (very sensitive to temperature, though). In your circuit, diode D3 is reverse saturated, so it can give any voltage drop needed to balance the circuit. D1 and D2 carry only 1/2 saturation each, so they are not saturated and will have a smaller voltage drop (non-saturated reverse junctions will probably be poorly modeled in the simulator). The resistor also doesn't cause a significant voltage drop because the current is very low. So basically, the simulator will cause most of the reverse voltage drop to be seen across D3 (which is probably realistic). When the diodes are forward biased, most of the voltage drop will be across the resistor. Edit: this is only valid if all 3 diodes are the same type. If you replace all 1N4007 by small 1N4148, probably it will be similar. But if you mix them... should be a fine mess.